The moment of waking is an unguarded one. This moment closes quickly once the mind trips into management and planning and the heart wraps itself in defensiveness as it surveys the day ahead. Might Life be found in the unguarded moments? In flashes where I am undefended, when self-protection is not the default posture towards life, and God? In faith terms there is the movement from naivete (open acceptance) through critical reflection (necessary questioning) and on to a second naivete*, a season where we feel called back again to an openness to old truths in a new way. This naivete calls for us to take off the defensiveness that has accumulated like layers of dead skin or the grave clothes that are no longer appropriate. Maybe when Jesus provocatively (and obscurely?) states that we must become like a child he is suggesting that our journey is in part a movement towards being non-defensive, becoming receptive and exploratory rather than calculating and controlling. A David Whyte poem** describes a movement from the secret honest world seeping into an openness on waking and then a closing on planning. Lazarus emerges blinking from the tomb feeling his way back (or is it forward?) What is the direction of this movement? Or is it just about the moment? He is called out from confusion and darkness into a fresh, brilliant light. I wonder if this ‘awakening’ is a repetitive pattern, a recurring wooing and an eddy of healing that recurs throughout our lives? Called out into light, unwrapped, awakened. 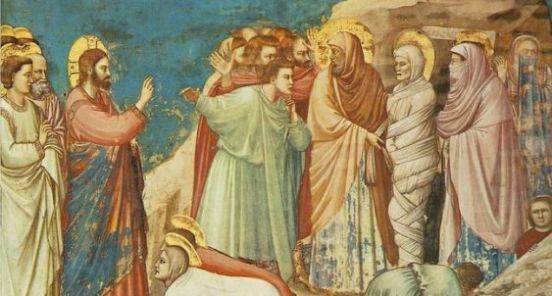 Like Lazarus, we too are not finished with our changes.